On his way to victory: Andy Murray returns against Mackenzie McDonald. Andy Murray believes he overcame a big mental hurdle with his hard-fought comeback win over Mackenzie McDonald at the Citi Open. Murray, playing for the first time since pulling out of Wimbledon, converted his seventh match point to clinch a three-set victory and set up a meeting with fellow Briton Kyle Edmund in the second round in Washington DC. The two-time Wimbledon champion toiled for more than two-and-a-half hours against world No 80 McDonald, taking the match 3-6 6-4 7-5, just his second win of an injury-interrupted year. “It was a tough, tough match,” the 31-year-old said. “It could have gone either way. Obviously if you lose a match like that, it’s a tough one. When I lost to (Teymuraz) Gabashvili here (three years ago), I lost serving for the match, so I was thinking about that a little bit, too. It is just nice to get through. I wasn’t dictating many of the points. I wasn’t hitting the ball that cleanly. I just fought and tried to make it tough for him. McDonald, 23, broke two of Murray’s opening three service games and wrapped up the first set 6-3 inside 40 minutes. But Murray drew things level, taking a crucial game nine in the second for a 5-4 lead and serving out the set. A 73-minute deciding set followed, in which Murray took an early break and found himself 5-4 up and serving for the match. McDonald saved five match points and converted his second break point to draw things level at 5-5. Murray broke back for a 6-5 lead following a controversial call when McDonald’s racket was adjudged to have crossed the plane of the net at 30-30. The former British No 1 then made no mistake in serving out the match. The former world No 1, ranked 832, is continuing his protracted recovery from long-term hip trouble. Murray had surgery on his right hip in January, only returning to action on June 18, losing to Nick Kyrgios at Queen’s. 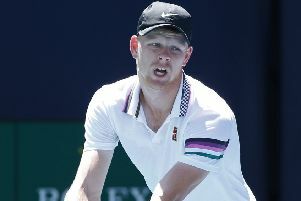 He later overcame Stan Wawrinka at Eastbourne, only to lose in straight sets to Yorkshireman Edmund two days later and then withdraw from Wimbledon. The Citi Open is just his third tournament of the year. He faces Edmund again and admits he has to up his game.